TradeIndia, India’s largest B2B portal has been recently awarded as India’s Best Online B2B Marketplace for the year 2018 by International Brand Consulting Corporation (IBC), USA for the organisation’s tremendous work in promoting millions of Small and Medium Enterprises (SMEs) online. The Award Presentation Ceremony was organized on March 8, 2019 at The Leela Hotel in Mumbai. A gala dinner was also hosted by IBC Corporation for over 200 people who attended the function. The people who witnessed the celebrations included leaders of several business fields and service categories and many other eminent guests. Apart from Tradeindia, other brands that have received this award earlier include Samsung, Reliance Jio, Amul, Aajtak, Taj Hotels, Tata Godrej, ICICI Bank, Star TV, LIC, Sun Pharma, Flipkart, Britannia, Syska LED and Surf Excel. Garnier, Blue Dart, Titan, Tanishq, Infosys, Indian Oil, Asian Paints, Ultratech Cement, DLF, Dabur, Indigo and Voltas. “TradeIndia is honored to receive this award. We promise to all our customers that we will serve them with the same excellence in the future as well. 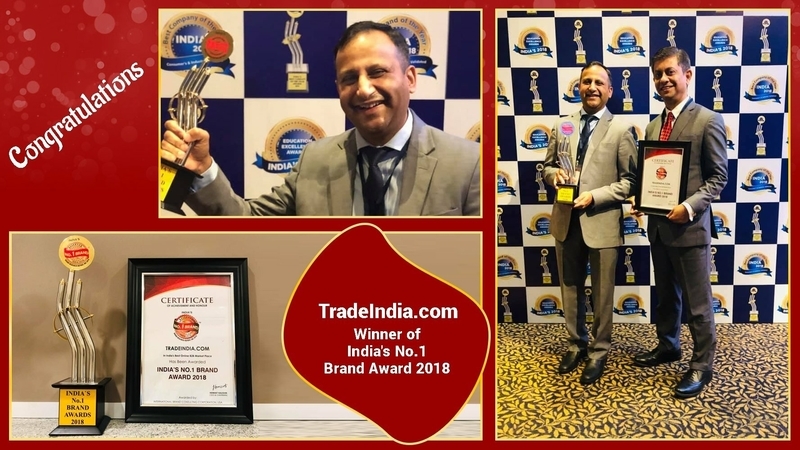 The award is totally credited to our hardworking team and customers, who trusted our abilities,” Mr. Sandip Chhettri, COO of Tradeindia said.